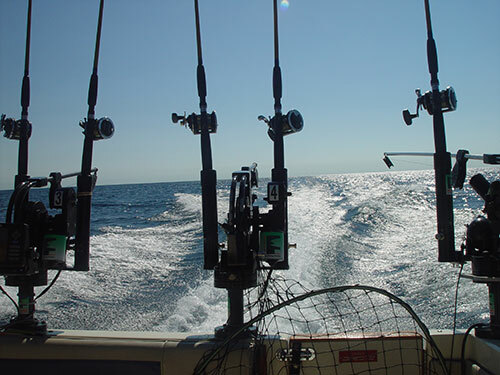 Lake & Stream Charters is about catching fish while being safe and comfortable. Our crew has 35+ years of experience fishing Lake Huron for Salmon, Lake Trout, Steelhead, and Browns. The Alpena/Thunder Bay area is a scenic, easy going, friendly community which offers a place to relax a bit and have fun catching fish in beautiful clean Lake Huron. The sunrises are awesome too. Whether you have a group of friends, corporate people, or families (bring your young people) - check us out! Many people come back again and again for a great experience on Lake Huron with the LS II and crew. The season starts in May with a mixed bag of Salmon, Lake Trout, Steelhead, and Browns, and maybe a Walleye. In July and August, the Salmon catch builds with the larger Salmon and Lake Trout showing up to be caught.